The global smart pills market is segmented on the basis of applications and regions. The market by applications is categorized into capsule endoscopy, drug delivery, and patient monitoring. On the basis of regions, the market is divided into North America, Europe, Asia, and Rest of the World (RoW: Pacific countries, Africa, and Latin America). Factors such as favorable reimbursement scenario, patient preference for minimally invasive procedures, technological advancements in endoscopy procedures, and rising prevalence of colon cancer are driving the growth of this market. Moreover, benefits provided by the smart pills technology such as technological advancements in endoscopy procedures, targeted drug delivery, and easy remote patient monitoring are propelling the adoption of this technology. On the other hand, in spite of numerous benefits offered by the smart pills technology, certain barriers such as technological incompetence of capsule endoscopes, high costs, and fear among patients regarding swallowing a microchip are hindering the growth of this market. North America is the largest market. The high growth of this region can be attributed to the favorable reimbursement scenario, FDA approvals for smart pills, and rising investments by government and other agencies. The prominent players in the global smart pills market include CapsoVision, Inc. (U.S.), Given Imaging, Inc. (Israel), Medimetrics S.A. de C.V. (Mexico), Olympus Corporation (Japan), and Bio-Images Research Limited (U.K.). The smart pills technology is increasingly being adopted by the healthcare industry across the globe in order to improve the efficiency and ease of endoscopy procedures. This report studies the global smart pills market over the forecast period of 2014 to 2024. The Smart pills market in 2014 is valued at $1.56 billion. It is forecasted to reach $3.83 billion in the year 2020, growing at a CAGR of 16.16% (2014 – 2020). This will continue to reach $8.98 billion by the year 2024, growing at a CAGR of 23.7% (2020 – 2024). The smart pills market is segmented on the basis of applications and regions. On the basis of applications, the market is segmented into capsule endoscopy, drug delivery, and patient monitoring. The capsule endoscopy segment accounted for the largest share of the global market. The smart pills technology provides targeted drug delivery methods and patient monitoring. Furthermore, reimbursement announced by governments in different countries has stimulated the adoption of capsule endoscopy. However, in spite of the numerous benefits offered, barriers such as technological incompetence of capsule endoscopes, high cost, and fear among patients regarding swallowing a microchip are restraining the growth of this market. 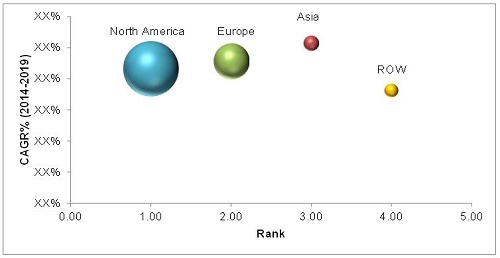 The North American market dominated the global smart pills market. The largest share of the market can be attributed to the favorable reimbursement scenario, FDA and other approvals for smart pills technology-based products, and increasing investments by government and other agencies. The Asian market is relatively new to smart pills technology; however, increasing investments by corporate players, changing reimbursement scenario, and support for endoscopy research in this region will drive the growth of this market. The major players of the global smart pills market are CapsoVision, Inc. (U.S.), Given Imaging, Inc. (Israel), Medimetrics S.A. de C.V. (Mexico), Olympus Corporation (Japan), and Bio-Images Research Limited (U.K.). 5.1.5 Bowel Scope Screening is Expected to Have A Positive Impact on the Endoscopy Market in the U.K.
12.2 Bio –Images Research Ltd.
12.13 Proteus Digital Health, Inc.